There is a lot of information in this post. Please read thoroughly. Tomorrow is the big day! Woo-hoo! Unfortunately, there's been a slight change to the itinerary for tomorrow only. The district denied our request to leave a half hour early from school. (It's a whole big thing dealing with having to apply for a third day and all. Too many details to get into. If you want it explained, please feel free to call me.) Anyway, because we're going to play nice, we're just going to leave 45 minutes later than planned. This means the kids will stay in class until the end of the day and then hurry and get their stuff and get on the bus as soon as they can. It's a bit of a curve ball, but nothing we can't handle. The rest of the trip will go as planned. The itinerary has been updated to reflect the changes. Mr. Matthews has reserved the large practice room for storage of travel gear. It will be locked all day. Kids can store their stuff there for the day so they can save time going to their cars. If you want to bring their stuff to them, please make sure to arrive before 2:30 pm. Chaperones, please plan on arriving around 2:00 so we can have a pow wow before the kids get there. Jewelry can be worn, but make sure it's not loud and gaudy. The kids will change after this performance and all concert attire can be left on the bus. It would be a good idea to have a bag of some sort to store concert clothes in. We will figure out how to store the tux bags on the bus for the trip. Jeans or khaki type pants. Please try to wear pants without holes. We realize most jeans come with holes these day. If you have no jeans without holes, wear your least holey ones and maybe wear leggings underneath so skin is not showing. Closed toed shoes. Disney specifically states that "socks, bare feet, sandals, and flip flops are not permitted". The kids may change after the workshop when they go to put their instruments back on the bus so they don't have to carry around their workshop clothes. We ask that they keep their tour shirt on that day, though. The forecast for Anaheim on Thursday and Friday is in the low 60's and partly cloudy. At night, the temperatures may drop into the 40's. Since the band will be staying until the park closes each night, they may want to have warmer clothes with them--at least a jacket. Region Solo and Ensemble is Thursday, March 8th at Riverton High School. The link is on this blog under the Forms and Information tab. Next year, Varsity Jazz Band will be a class during the day! Auditions for this class will be held after school on March 20th. 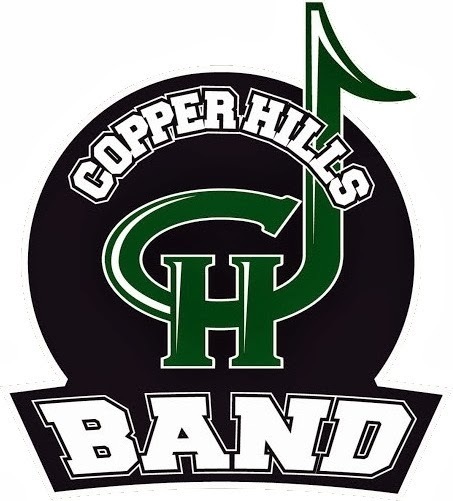 Watch for a sign-up on the band room doors. If you have any questions, please ask Mr. Matthews.